When you have a big property clearance planned in Bromley, you want to do everything possible to make the process run smoothly. By being organised and planning in advance, you can make a big difference to the clearance day. If you’ve set aside a weekend to have your house clearance overhaul, skip hire is a great service to consider. - Garden waste clearance: keep this one in mind if you are renovating the garden and think you will have excess green waste. Rather than stuffing your green waste bin full to the brim, hiring a skip will alleviate much pressure on the day. You can toss any type of garden waste from branches and leaves to grass and clippings in this type of skip. However, ensure that any tree trunks with a diameter larger than 20 centimetres and stumps greater than 30 centimetres in diameter are not put in here. - General waste: this one is good for a domestic clearance in the home as well as property clearance in the yard. Any household items from various odds and ends to broken appliances, general trash to office waste, can be disposed of in here. If you are in need of furniture clearance in the BR1 area, there are skips that can accommodate for this. You may need a larger skip for this. With general waste skip hire, make sure you don’t put any liquids, tyres, food waste, batteries, garden waste and bricks in these. - Concrete and bricks: this type of skip hire is very useful if you are renovating the driveway or clearing a back yard. All concretes and bricks can be broken up and put in here. These are the only acceptable types of waste for this skip hire. - Heavy waste: again, this type of skip hire is practical when renovating a yard and having a property clearance in Bromley. Any concretes, bricks, rocks, tiles, pavements and soils can be disposed of in this skip. 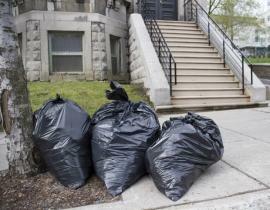 General waste and green waste is also acceptable, which will make a backyard clearance much easier. Please note that liquids, food waste, batteries and tyres cannot be placed in a heavy waste skip so this needs to be kept in mind. Arranging for a skip to be delivered on the day and taken away at the end of the hire period is efficient and easy. At the end of a long day clearing your property, the trash will magically be taken away and won’t be your problem anymore. You can’t ask for more than that!